NOTICE: Due to health issues no products will be available to order until further notice. This book is 60 pages long, printed in black and white, with illustrations by the artist. The instructions include the anatomy of the human skull, sculpting in batting, and needlemodeling in nylon. $28.00 includes shipping, MA residents add $1.25. For orders outside the US see Order Form. Basic Head, or The Persephone Video. $33.70 includes shipping, MA residents add $1.50. Figures in Fabric - The Sculpture of Lisa Lichtenfels. 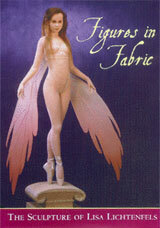 A 20-year retrospective of Lisa's work and the step-by-step process of creating a fabric sculpture. An in-depth study with 36 pieces presented in detail, more than 500 color photos are included. This hardcover book is 160 pages long, 12 1/4" high x 9 1/4" wide. $60 including postage, MA residents add $3.00. For orders outside the US see Order Form. The Persephone DVD - A two-disc instructional DVD set on head construction. 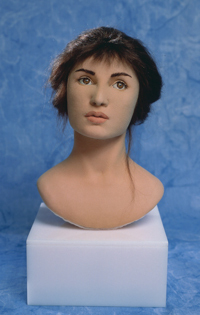 This includes instructions on skull shapes, wire supports for features, sculpting in batting, and delicate needle modeling for realistic facial features. Four hours of instruction on two DVDs. (4 hours of instruction on 2 tapes) available at the same price - while supplies last. Price includes postage. Massachusetts residents, please add $2.50 sales tax. The Ama - Soft Sculpture Body Construction. A three-disc DVD set. Almost five and one half hours of instruction shows all aspects of building a body in soft sculpture. It includes basic anatomy -- the shapes and placements of bones and muscles. It gives directions for creating a wire skeleton that you can pose and balance; and there are directions for building muscles in batting and for layering nylon as realistic skin. $67.00 in the US, $68.00 in Canada, $86.00 Overseas. Includes Postage. For customers with PAL format there is still a 2-tape video set available for $102.00, while supplies last. 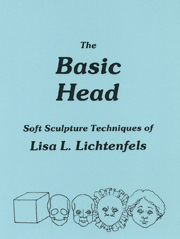 All of Lisa’s sculptures created after 1992 are available in Limited Edition Prints. After finishing a sculpture, Lisa places the figure in an environment. Sometimes these are simple -- a colored background with elegant lighting, but often elaborate environments are created to help tell the story of the character. The process of photographing a piece often takes several months. “I love the process of photographing my sculptures. After creating an environment, I work out the details of the image shooting several rolls with a medium format camera. This would include the angle of the view, final details of the environment and film exposures. Then I set up my big large format camera. It is beautiful instrument -- technically unchanged since it’s type was invented in the 1870s. No camera made since is capable of capturing the details and overall view that this camera can, the end product is elegant. Each photograph is individually printed with the highest-quality materials and technical standards with sculpture title, edition number and artists signature. Because of this individual attention, please allow 30 days for delivery. 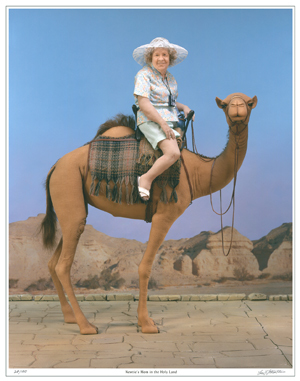 Each photograph is limited in number to an edition of 700 prints. All Salon Prints are shipped flat and ready for framing. Size is 13" x 19", $100.00 each (includes shipping). All artwork and images displayed in this website are protected by © Copyright Lisa Lichtenfels.